Outside the USA - Most of the early AR-88 production was sent to Great Britain or Russia (and to a lesser extent China and France) during WWII through Lend-Lease and this accounts for the scarcity of the early versions of the receiver in the USA. The Lend-Lease Act of October 1941, allowed the USA to supply materiel to our Allies in exchange for permission to build and operate bases in the allied countries or territories. The AR-88 was used extensively in Great Britain during WWII for varied purposes. The AR-88 was used for several purposes by Great Britain during WWII. 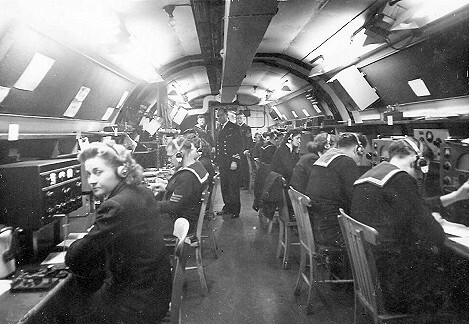 This is a photo of the Portsdown Tunnel communications center that handled wartime communications. 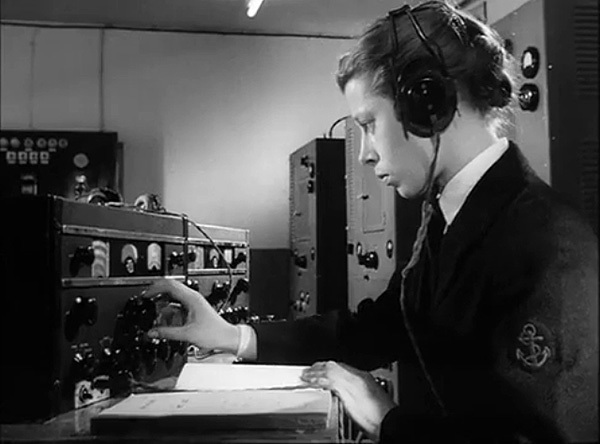 Note that the WREN (Womens Royal Navy Service) to the left is using an AR-88 as the communications receiver. Many of the British AR-88s were destroyed after WWII ended. This was due to the provisions in the Lend-Lease Act which stated that materiel had to be either returned or destroyed. In just one incident, a load of AR-88 receivers was "dumped" into an abandoned well by USA forces after the war ended. Some sources even indicate that RCA had made it clear they did not want to see the receivers back in the USA for any reason. The AR-88 survivors, along with other surviving materiel, generally were placed in groupings that were "sold back" to Great Britain at discount, which was usually at "ten cents on the dollar." Still, lots of the AR-88s survived and they were considered a common and easily available receiver in Great Britain for several decades after WWII. The easy availability of AR-88s made them a popular amateur receiver in the 1950s and 1960s. 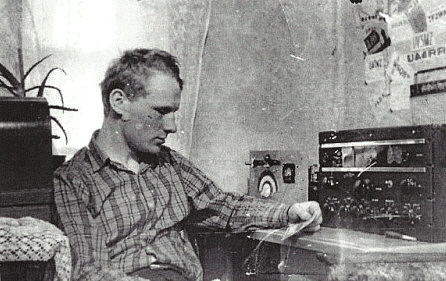 Shown to the right is the typical British ham, G5FA, with his AR-88D station receiver. Photo is from the G5FA QSL card. >>> AR-88s survive in Russia because a large quantity were sent over as part of Lend-Lease in the later part of WWII (after the USSR became an Ally.) The receivers were used for both surveillance and communications during the war. After the war ended, it is assumed that none were returned and it's unlikely that any were destroyed. The USSR continued to utilize the AR-88 after WWII as it had during the war, that is for military and surveillance purposes. 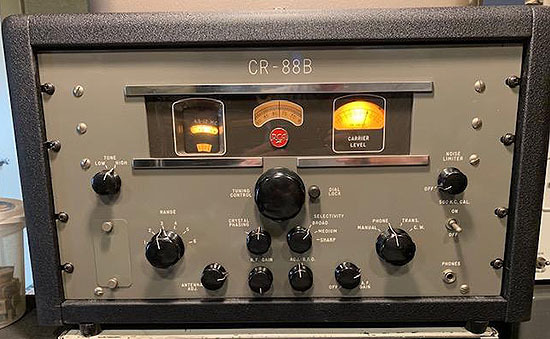 By the late-1950s and early-1960s, the AR-88 was showing its age and the receivers must have become available to ham club stations as it was very common to QSO Russians on 20M CW who were using an AR-88 for the station receiver. More on UA-UK use of the AR-88 in the section "AR-88 and Russian Hams" below. Inside the USA - After WWII, RCA and Radiomarine Corporation of America (a division of RCA that handled all of RCA's maritime radio business and operations) continued to use the AR-88 and its variants in their own installations for various purposes. Most were in large coastal stations that provided worldwide ship-to-shore message handling via RCA Radiograms. Although single receiver operation was common, RCA/RMCA also utilized the AR-88 at installations in a triple diversity receiver designated the DR-89. 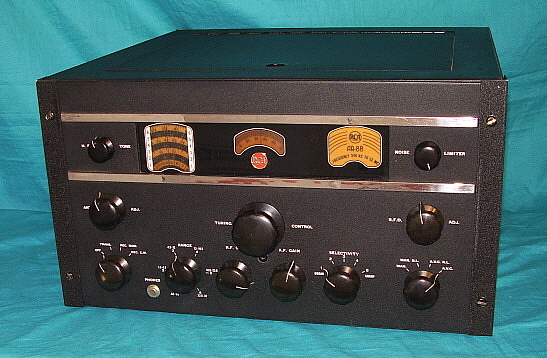 In 1945, RCA replaced the AR-88 with the CR-88 which placed the Crystal Phasing control on the front panel and reduced the size of the RF Gain and AF Gain control knobs so all three controls would fit just below the tuning dial. The CR-88A replaced the AR-88F in the diversity receivers. Even in the mid-1970s, these incredible diversity receivers were still being used in RCA/RMCA stations. Parts for maintaining the aging receivers were scrounged from the WWII repair depots that had been set-up in Tangiers and San Juan, Puerto Rico during WWII. Unfortunately, most (probably all) of these incredible Triple Diversity Receivers were scrapped out with usually only the receivers themselves surviving to be sold as surplus. Even the US Military used some of the later AR-88 variations in their installations that required a high performance, highly reliable receiver. During the latter part of WWII the Navy used a Triple diversity receiver that was essentially the RCA DR-89 but was given the Navy designation of RDM. This diversity receiver was mainly used for data transmission in the form of CW, High-Speed CW and RTTY. Voice could be used but the RDM was primarily for reliable data reception. After WWII, the Navy continued to use the RDMs up to the 1970s. By 1949, the U.S. Army Signal Corps wanted their own version of the DR-89 for the same use as the Navy. RCA supplied a slightly updated version of the DR-89 that was designated as OA-58A/FRC. Not very many were produced with estimates being less than 100 OA-58s made. The receiver used was the SC-88 of which about 300 were produced. Some AR-88s found their way into monitoring positions in several Shortwave BC stations around the world. By the early 1950s, the RCA '88 receiver was still one of the best for stability, sensitivity and high fidelity reproduction available. With the modernized CR-88B, RCA began producing the last AR-88 version in 1951. The CR-88B, is the only variant to actually dramatically change the receiver, both in appearance and design. The CR-88B increased the tube count to fifteen, adding Push-Pull audio output. Also added was a 100kc Crystal Calibrator. Changes included a two-position Tone control, a three-position Selectivity switch and a different chassis layout that moved the power transformer forward behind the front panel. The CR-88B was in limited production until 1953 and it is the rarest of the entire series. In the mid-1950s, the Chinese built very close copies of the CR-88 receiver, the WS-430. The front panel nomenclature is entirely in Chinese as is the data plate attached to the receiver's chassis. Russian "octal" tubes are used in the earlier versions but later receivers were equipped with some miniature tubes. Photo below in "Collector's Gallery of AR-88 Series Receivers." Production level of the AR-88 series was rather high during WWII with approximately 25,000 total receivers built. After WWII, the demand was greatly reduced since the only users were commercial users and the military. The AR-88 series was never offered to the ham market and was generally not available as a new product to the average consumer. The serial numbers seem to indicate that post-WWII production was less than 10,000 total receivers and probably closer to about 5,000. This estimate brings the total AR-88 series production to around 30,000 receivers - far less than the normally quoted 100,000 plus receiver production. So, what was the selling price of the AR-88? It seems to be a mystery lost in the bureaucracy of the Lend-Lease Act and later RCA commercial advertising. By comparing the AR-88 receiver to its predecessor, the AR-60, which sold for $475 in the configuration used by the USCG (the CGR-32-1,) one can estimate that the AR-88 cost at least $475 - maybe even slightly more. Of course, this is just a guess. If anyone does know a specific price assigned to any of the AR-88 versions, please e-mail me and I will add that information to this article. Today, the AR-88 and its variants can be found in ham shacks and at amateur SWL set-ups around the world. Its world-wide fame was earned with hard work and service. This hard work has resulted in many AR-88 survivors being found in rough condition, missing parts and almost certainly, non-functional. Fortunately, there are still enthusiasts that scavenge parts in order to perform operational restorations of these incredibly stout receivers. With fans around the world, the AR-88 and its variants are assured of continuing survival. 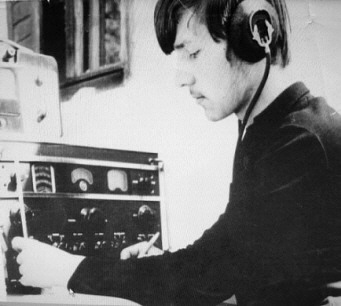 The AR-88 and Russian Hams - Many of the UA and UK stations worked on CW 20M in the nineteen-sixties and seventies were using the AR-88 for their station receivers. Most of the QSL cards from these Russian hams would just say that the receiver was a "14 tube Superhet" but we all knew that meant they were using an AR-88. >>> With much more advanced receivers planned, the Soviet military felt by the late-1950s the AR-88 was beginning to show its age and its release into the hands of hams would pose no military communications security problems. As even more advanced receivers became available to the military by the mid-sixties the last of the surplus AR-88s were disposed of. Certainly, by the seventies, many of the AR-88s that had been released earlier were now exchanging hands between the Russian hams. Many Russian hams started in amateur radio by becoming an SWL (Short Wave Listener) at a ham club. This usually required the aspiring ham to confirm reception of several ham stations in the CW mode by obtaining QSL cards from the station copied. 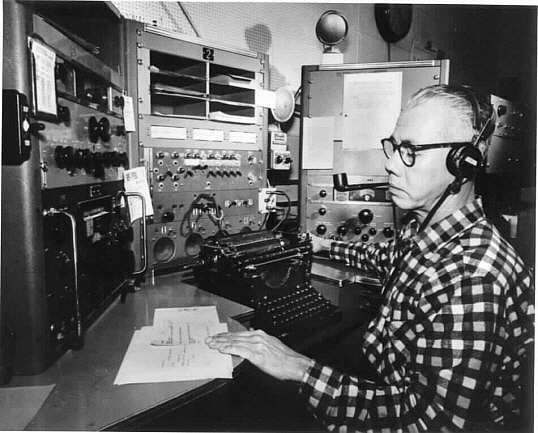 That was why it was so important for USA-hams to actually respond to the SWL QSL cards they received - it helped the aspiring ham prove that he could copy "on-the-air-sent" CW, issue accurate, dated signal reports in the form of a QSL card and was able to receive a confirmation QSL card "via the Bureau." 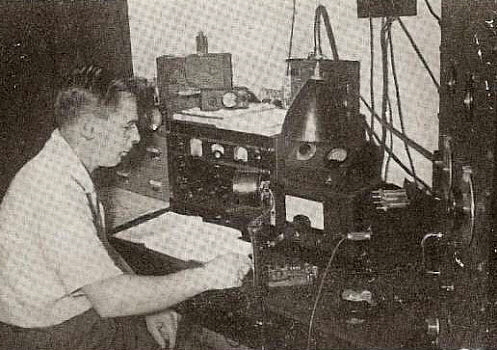 Often, once the license was issued, the new ham operated at a club station until he was able to buy or build his own equipment. 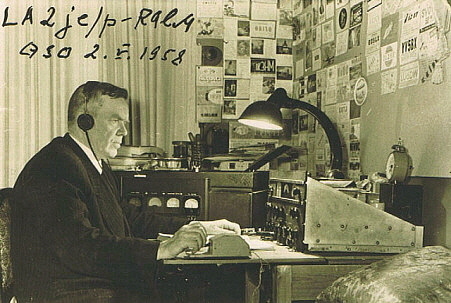 Many UA and UK stations worked on 20M CW in the sixties and seventies were club stations. However, many of the AR-88s also were in the hands of ham stations owned by individuals. Nowadays, most of the AR-88s in Russia are either in the hands of collector-hams or in various technical or radio museums. Thanks to Serge UA1OSM for the details on Russian military receivers and the AR-88 history in Russia. The Circuit and Construction Details - The AR-88 tunes from .54mc up to 32mc in six bands. It uses 14 tubes in a double preselection superheterodyne circuit. The HF front end coils are wound on polystyrene forms that have extremely low losses allowing the receiver to maintain high sensitivity up to 30mc. The gear reduction tuning is substantial and was often referred to as "continuous bandspread." A logging system using two separate dials provided accurate resetability. The AR-88 provides five steps of selectivity with position 1 and 2 being rather broad for good fidelity while positions 3,4 and 5 use the crystal filter for increasingly narrow bandwidth. The receivers use three stages of 455kc IF amplification with stagger-tuned IF transformers. Two under-coupled IF transformers and two over-coupled IF transformers are utilized when the receiver is operated in the "BROAD" POS. 1 selectivity position. To assure that the passband is symmetrical usually requires a sweep generator and oscilloscope for proper alignment (a detailed procedure is provided in later version manuals) However, if fidelity is not an issue, there is a procedure to align the IF section using just a VTVM but the results are usually not as good as the sweep method. AR-88 receivers also have a clipper-type Noise Limiter and a High Frequency (limiter) Tone control. The audio output is from a single 6K6 providing about 2.5 watts of power to a 2.5 ohm Z output transformer (600 ohm Z and Hi-Z phones outputs are also provided.) The various models sometimes had a Carrier Level meter incorporated into the circuit however most receivers didn't, initially due to a shortage of meters that occurred during WWII. The wiring for the meter was sometimes included in the harness for future installation of a Carrier Level meter, if they became available. Generally, the wires for the CL meter connection are bolted to the lamp bracket behind the receiver's illuminated ID window. Diversity model receivers did not incorporate a CL meter because output meters were included in the diversity rack. The receiver power supply uses a potted power transformer and two potted filter chokes. The filtering is provided by an oil-filled, triple unit utilizing paper capacitors. Only the AR-88LF and the CR-91 receivers have AC line fuses that are chassis mounted. All other versions required the user to provide a fused AC line. A VT-150 is used to provide a regulated +150vdc for the LO and BFO plates and for the RF/IF screens to improve stability and reduce drift. The AR-88LF and CR-91 were versions with LF and MF coverage in place of the AM-BC band using a 735kc IF to allow continuous coverage in two tuning ranges from 70kc up to 550kc in the LF and MF part of the spectrum and continuous coverage from 1.5mc up to 30mc on the remaining four tuning ranges. The CR-91 uses a 6V6 in the audio output. Early versions of the AR-88LF use a different power transformer with a two position AC primary voltage selector switch and a different audio output transformer that has a single tapped winding providing 2.5 ohm Z and 20 ohm Z outputs. Mechanically, the receivers were stoutly built. Heavy steel chassis and an almost quarter of an inch thick, copper-plated steel front panel were the foundation for component assembly mountings that are entirely put together with screws, lock washers and nuts. This was to allow extensive disassembly to be easily and quickly done, the repairs performed, followed by easy and quick reassembly. The only rivets used in the receiver are for the clips that mount the adjustment tools. Early receivers had the chassis side panels bolted in place but late receivers will have the chassis side panels spot-welded to the chassis. The ultra-heavy duty construction made for a stable receiver but also added to the weight. The AR-88 weighs in at just over 100 lbs. when installed in its cabinet. The Diversity Receivers - Many of the AR-88 receivers were used in Triple Diversity Receivers like the DR-89 - a seven foot tall rack loaded with three AR-88F receivers and all of the auxiliary equipment necessary for professional diversity reception. The DR-89 was initially produced during the latter part of WWII. As with the single AR-88 receivers, DR-89s were sent to our Allies during WWII as part of the Lend-Lease Act of 1941. The US Navy also used the diversity receivers with the designation of RDM. The receivers used in the DR-89/RDM are slightly different from the standard "stand alone" receiver. For instance, even if meters had been available, the Diversity AR-88 receivers would not have Carrier Level meters installed because the Diode Load from each receiver was connected to the Tone Keyer of the DR-89/RDM rack where the signal was routed to the Monitoring Unit which contained three Output Level Current Meters, one for each receiver. All AR-88 receivers (and their variations, e.g., CR-88A) that were intended for use in the RCA Triple Diversity Receivers will have a "DIVERSITY IF GAIN" control on the front panel for balancing the three receivers in the rack This provided a method of adjustment for equal diversity effect (referencing the desired signal) even if the receivers and antennas were not exactly identical in their performance. There are some resistor changes in the IF section to enhance diversity and AVC characteristics. The U.S. Army Signal Corps had their versions of the Triple Diversity DR-89 with the Signal Corps ID of OA-58A/FRC. These diversity set-ups used a different, upgraded receiver, the SC-88. Not all Diversity Receivers were used exclusively in the Triple Diversity Receivers, however. 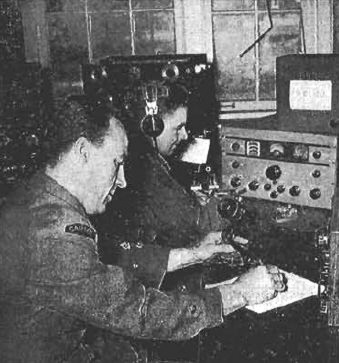 Shown in the photo above is the RCAF listening station #5 Radio Unit at Whitehorse, YK, Canada from the 1950s showing the CR-88A "diversity" version receiver used along with the Hammarlund SP-600 JX receiver. Note that the CR-88 has the "Diversity IF Gain" control which identifies the receiver as a Diversity model (no CL meter either.) When operated as individual receivers, a diversity receiver's performance will be identical to standard non-diversity receivers. It seems likely that RCA supplied Diversity models for many applications other than solely for the Triple Diversity Receivers. More Details on the "Triple Diversity Receivers" below. AR-88 - The earliest stand-alone receiver version which may or may not have a cabinet depending on installation. Produced early part of WWII, earliest versions have solid light-yellow dial (not alternating black and yellow scales) and possibly the front panel nomenclature might be engraved. AR-88D - The later stand-alone receiver version with table top cabinet, produced during WWII and for a short while after, sometimes with Carrier Level meter, matching speaker - usually black but there are some exceptions. "D" does NOT indicate a Diversity receiver. AR-88LF - Stand-alone receiver early LF/MF version with 70kc to 550kc coverage and 1.5mc to 30mc coverage, earliest versions have two position AC voltage selector (115/230vac,) different (from AR-88) power transformer, different audio transformer, different phone jack operation (no load resistor,) changed after SN 3000 to use same power supply and audio section components as in AR-88D. Possibly all "LF" versions were assembled in Montreal. 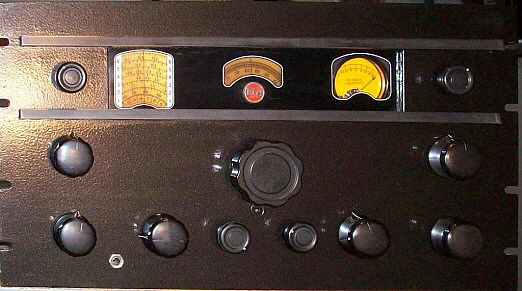 CR-91 - Stand-alone receiver, late WWII version with table top cabinet, circuit similar to later AR-88LF, black wrinkle finish panel and cabinet with "PHONE" and "BFO" on the Function switch rather than "REC MOD" and "REC CW." 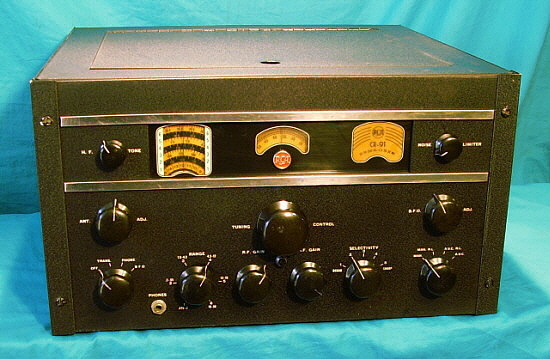 The CR-91 recievers were the RCA-Camden, NJ,USA version of the AR-88LF for WWII. CR-91A - Post-WWII upgraded version with front panel Crystal Filter Phasing, gray panel, other post-WWII upgrades. Successor to AR-88LF with all (?) versions built in Montreal, Quebec, Canada. Shown in the photos to the right is the chassis of a CR-91 receiver. All versions except the CR-88B receiver, are virtually identical to each other. The RF cover is removed in the nearest photo to reveal the tuning condenser cover. Normally, both filter chokes are identical however the round choke is a replacement. The middle photo show the underside with the shield removed from the RF and Mixer coil box. If the receiver was rack mounted then a bottom cover was installed. The photo far right show a close-up of the polystyrene coil forms used in the high frequency coils. The CR-88B chassis was changed to allow adding the push-pull audio tubes. The power transformer was moved forward to have the receiver weight distributed more towards the center of the chassis. The AR-88s tended to be very heavy towards the rear of the chassis adding to the difficulty of lifting the receiver. Note that standard "can" electrolytic filter capacitors are used rather than the large oil-filled paper filter capacitor assembly. The IF transformers were reduced from eight transformers to six which implies two IF amplifier stages in the CR-88B rather than the three used in the AR-88. Rear chassis connections show a "phono input" available. Also note that "AVC" and "DIODE LOAD-RETURN" terminals are provided which implies that the CR-88B could be used in a diversity set-up. The antenna input was moved to the RF tuning box. Antenna Input Connections - The AR-88 receivers that were intended for surveillance or intercept work are connected up and operate much like any other vintage communications receiver. The Antenna Input Z is 200 ohms but the receivers have an Antenna Trim control that allows a wide variety of antennas to perform well with the receiver. Band 1 (AM BC) was designed to work well with an end- fed wire antenna but on the higher frequencies, a matched antenna will give the best results and use of a separate antenna coupler will provide the receiver with the best match to any antenna. The AR-88LF and CR-91 receivers were designed for a capacitive antenna on Bands 1 and 2, which cover the LF and MF frequencies. Anywhere from 500pf to 700pf works fine and can be accomplished with an end-fed antenna around 200 feet in length. Shorter antennas will detune the 1RF amplifier unless capacitively loaded.. Tuning and Logging Dials - The very first AR-88 tuning dials were solid light-yellow with black nomenclature. These dials were used probably up to about serial number 3000. By late-WWII production, the tuning dials became alternating black and light-yellow backgrounds with the nomenclature oppositely alternating accordingly. After that, all versions used the black and yellow "striped" dial until the dial mask was fitted to the SC-88 and the CR-88B. These receivers went back to the solid light-yellow dial with black nomenclature. The dial color we see today on the AR-88 receivers is much darker than original. The darkening is especially intense where the dial was exposed to sunlight. This usually resulted in portions of the dial appearing very dark amber and other sections appearing orange or yellow. Original color was very light yellow. Power Supply - The power transformer is robust and a potted unit that seldom has any problems. The primary has five taps that are routed to a rear panel switch that selects the proper AC operating voltage. The AC line is not fused on any of the receiver versions except the AR-88F and the CR-91. Two filter chokes are used. Some British magazine articles suggest that very early AR-88s had two different types of chokes. It's reported that the choke's dc resistance was 400 ohms for L-49 and 800 ohms for L-50. However, every manual and parts list I've seen indicates that the two chokes are identical with 400 ohms dc resistance. Actual measurements of the chokes in various AR-88s show the same result - that both chokes are identical. It's normal for L-50 to run slightly warmer than L-49, especially if the receiver has all original capacitors. The filter capacitors change over the years with early receivers using an oil filled, three capacitor pack. Later versions have three individual oil filled capacitors with two capacitors on top of the chassis and one capacitor underneath. Tuning Dial Resolution - The AR-88 receivers have what was called "continuous bandspread" action, which was a large gear reduction in the tuning that resulted in an almost vernier effect for tuning in stations. Since the AR-88 covers large slices of the spectrum in each tuning range, the tuning dial resolution is necessarily vague. When the AR-88s were in active use and the received frequency had to be accurately known (or set,) it was measured with a heterodyne frequency meter - all stations had them when frequency accuracy was mandatory. The Logging Dial then provided a very accurate way to reset to exact frequencies once they were known. Tuning and Logging Dial Positions - If the AR-88 front panel is removed, it will be noted that the two dials over-lap each other and it's possible to have either the logging dial in front of the main dial or behind it. If the receiver is the older style with the metal frame holder for the dial index then normally the logging dial should be placed behind the main dial. This assures that there is ample clearance for both dials to not interfere with each other and to also assure that the logging dial index doesn't rub against the logging dial hub. Later receivers with the plastic index usually have the logging dial in front of the main dial since the logging dial can be placed very close to the plastic index without rubbing. This latter positioning is also required on the receivers with the dial mask installation. CRV-46246A/B (RDM) Receiver 2.5 Ohm Z Output - These component receivers for the RDM were designed to work within the Triple Diversity Receiver rack. Specifically to connect the 2.5 ohm audio output terminals to the Tone Keyer input. Terminal 2 on the receiver is not grounded but achieves its ground inside the Tone Keyer. This was then switch routed to the Speaker Panel where the operator could select individual receiver outputs or the diversity output. Probably most CRV-46246A/B receivers have long since been modified to internally have Terminal 2 connected to the receiver chassis to allow the receiver to operate as a "stand-alone" receiver. However, it's possible a few receivers are still out there with the Terminal 2 ungrounded at the receiver. The ungrounded Terminal 2 may also apply to the commercial version AR-88F receiver. Later diversity receivers, CR-88A and SC-88, have Terminal 2 grounded at the receiver. 2.5 Z Ohm Output and 600 Z Ohm Output - The required speaker impedance for the AR-88 is rather low at 2.5 ohms to 3.2 ohms. Today it is pretty hard to find a 2.5 ohm speaker and the original AR-88 table speakers are quite rare. The 3.2 ohm Z speakers are fairly easy to find and work quite well with the AR-88. I have also found that the standard 4 ohm speakers work fine and allow a lot more choices for quality speaker selection. Using a 12" speaker in a floor cabinet with a bass reflex port will provide you with the excellent audio reproduction that the AR-88 is capable of. Lots of bass and, if aligned correctly, plenty of highs in the BROAD position. Using an 8 ohm Z (or higher) speaker will require the AF gain to be advanced quite a bit further than with the lower Z speakers. The lower Z speakers work best. The 600 ohm impedance output was provided to drive various devices or monitor functions via earphones and is not really a high quality audio source. I have always found it to sound a little "fuzzy" when compared to the 2.5 Z ohm output. 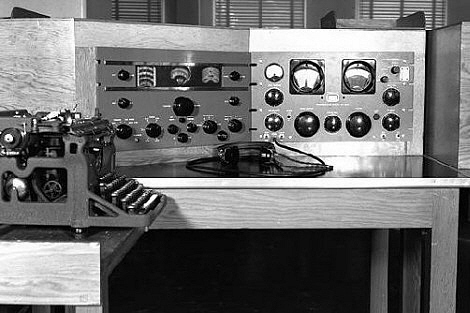 RCA Table Speaker for the AR-88D and CR-91 - When the receiver was intended for table top operation a matching speaker was available from RCA. It was listed as part number MI-8303D. The speaker was an eight inch diameter PM type that had a 2.5 ohm Z voice coil to match the output Z of the AR-88. 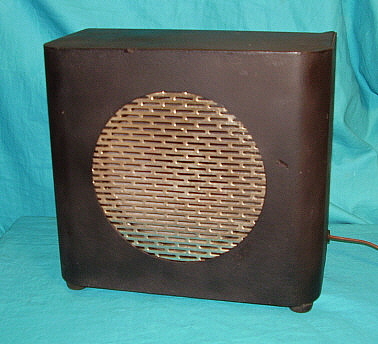 The speaker cabinet was usually black or RCA umber wrinkle finish and the grille was nickel-plated. 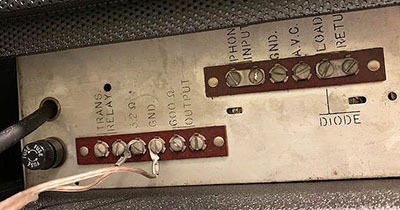 There are some photos that show the speaker grille where it appears painted but the RCA manuals always pictured the plated grille. The speaker cabinet has a back that is screw mounted and that is why the speaker cable exits from the side. The table speaker was only intended for use when the receiver was going to be installed where the requirement called for one receiver providing loudspeaker output. The MI-8303D was not used with the Triple Diversity Receivers and was certainly not required where multiple receivers were in use, such as for surveillance. Multiple receiver operations require the use of headphones for the individual operators. photo above: AR-88 CL Meter from EB5AVG's AR-88D receiver. Photo by: EB5AVG Carrier Level Meter - Very few AR-88 receivers had an original carrier level meter installed. At first it was the WWII meter shortage that was responsible. Then, after WWII, most of the RCA production of AR-88 series receivers were for diversity receivers where the carrier level meter was not required. As a result, only a handful of meters were ever installed in AR-88 receivers by RCA. 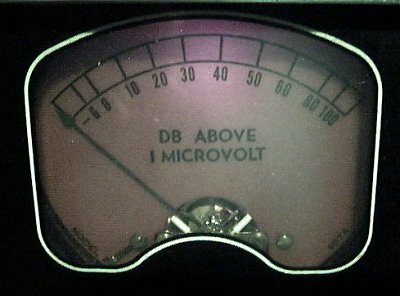 The meter, when an original RCA installation, is a right-hand mechanical zero with full scale deflection one division over -6db requiring 5mA of current flow through the meter coil. The meter scale is -6 to 0 to +100 db and also on the scale is marked "DB ABOVE 1 MICROVOLT" The meter is illuminated and the scale is light yellow-amber. As mentioned elsewhere, the carrier level meter wiring is included in the early production receivers with the two wires having their terminals bolted to the rear of the lamp bracket for the receiver ID plate. See schematic right for CL meter connections and resistor changes necessary. R21 is mounted on the rear chassis apron. The Hallicrafters SX-28 receiver uses an S-meter that has similar characteristics as the AR-88 meter. It is a right-hand mechanical zero with full-scale deflection to the left at 5mA. One can utilize the scale shown to the left to create an accurate reproduction of the AR-88 meter scale and then utilize the SX-28 meter. The circuitry shown to the right must be installed. A mechanical mount will have to be made to hold the meter in place. Connections are: To the junction of R20 (100 ohms) and C74 (4700pf) connect Meter +, Meter - to chassis. From Meter + connect R21 (100 ohm potentiometer) pin 3, pin 2 (arm) to chassis, pin 1 NC. Change R1 and R6 to 47K and R55 to 5.6K. Crystal Filter Crystals - For some reason many AR-88s will have had the crystal filter crystal removed. On the last models this might be understandable since the crystal plugs into a socket on top of the chassis. But the early versions have the crystal hard-wired underneath the chassis and, still, sometimes they will be missing. Fortunately, the 455.00 Khz crystal is available from International Crystal Manufacturing in OKC, OK. The 455.00 Khz crystal is a stock item and the cost is $25.00. If you need the 735 Khz crystal for the AR-88LF or CR-91, that one has to be special ordered from ICM. They will make one for you but as custom work, they are not cheap - $109.00. Remember, they have to grind the crystal and the low frequency crystals do require a different cut from the quartz, thus the expense. Diversity Receivers versus Standard Receivers - The AR-88F, CR-88A and the SC-88 receivers are slightly different receivers from the standard AR-88D, AR-88LF and CR-91 and other non-diversity receivers. Several resistor values are changed and some extra components added to enhance diversity operation. As individual receivers both types perform almost identically. All diversity receivers were normally rack mounted although there were certainly some exceptions, especially after WWII. Though the Standard Receivers do provide the AVC line output on a terminal marked "AVC" and this can be coupled to another standard receiver's AVC line, this only provides a crude form of diversity effect. In this type of diversity reception, the receiver with the strongest signal controls the AVC line and the gain of all of the receivers. This does work to control fading to a certain limit determined by the AVC delay and antenna types used. True diversity reception requires the detectors of each receiver to be tied together as the Diode Load and the AVC lines tied together for diversity system stability. When working on either a standard receiver or a diversity version of the AR-88 series be sure to use the correct schematic since there are many subtle differences between the receivers. The Diversity IF Gain Control - This control is normally only on the component receivers used in the RCA Triple Diversity Receivers - the DR-89, the Navy RDM and the Signal Corps OA-58A/FRC. This control adjusts the gain through the IF section of the receivers by using a variable resistance in the cathode circuit of the 1st and 2nd IF amplifiers. The Diversity IF Gain control allowed the operator to "balance" the three receivers in the rack using a test signal (usually the incoming signal.) Once adjusted, each of the three receivers responding with the same gain to the same signal which further enhanced the diversity effect. When the receivers are operated individually, the Diversity IF Gain can be advanced fully. Apparently, later in production the Diversity receivers were sometimes sold as individual receiver to certain customers. Consequently, some Diversity receivers might be found mounted in the proper RCA AR-88 cabinet as an original combination. Diversity, Monitor, Diode Load and Diode Return Connections - These connections on the rear terminal strip are only on the component receivers of the RCA Triple Diversity Receivers. When operating in diversity, it is necessary to have all of the second detectors outputs tied together which is done through the "Diode Load" and "Diode Return" connections. Additionally, the AVC lines from each receiver are tied together via the "Diversity" terminal. These receivers can be operated as a stand-alone receiver but it will be necessary to jumper the "Diode Load" and "Diode Return" terminals together. No connections to the "Diversity" terminal or the "Monitor" output are necessary for individual operation. Tuning Gear Box Variations - There are two types of gear boxes found on the AR-88 series of receivers. The most commonly found gear box is "Version One" (V-1) that, fortunately, is the most robust and problem-free type. The V-1 gear box is found on all of the AR-88 series receivers except for the CR-91A. V-1 gear boxes will have a 360º split-gear that is spring-coupled and mounted to the hub of the tuning condenser drive gear. 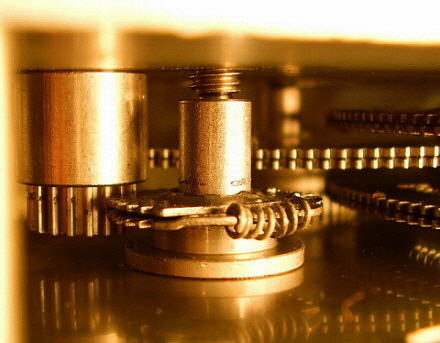 This split-gear drives the main tuning dial as the tuning condenser drive gear rotates. The fact that the split-gear is a full 360º piece adds to its overall strength. The V-1 gear box seldom has any problems other than the normal dirt and dust accumulation and occasionally an over-tight bearing adjustment. "Version Two" (V-2) gear boxes are only found on the CR-91A receivers, all of which were built in Montreal. The V-2 gear box has a 270º split-gear that is spring-coupled to drive the main tuning dial from the rotation of the tuning condenser drive gear. Since the V-2 split-gear is not a complete "circle" (not 360º) it's not nearly as strong as the full 360º split-gear in the V-1 gear boxes. The V-2 split-gear is prone to breaking teeth off of the gear that will result in erratic tuning dial operation. Of two V-2 gear boxes examined, both had broken teeth on the split-gear and neither gear box operated the main tuning dial smoothly. Since only two CR-91A gear boxes have been examined, it isn't known if all CR-91A receivers built had the V-2 gear box installed. It's likely that the V-2 gear box was considered a design "improvement" and may only be found on the later versions of the CR-91A. At present, I have examined an AR-88, CR-88A, CR-91 (Camden version) and an SC-88. All of these receivers have the V-1 gear box installed. Note that the SC-88 is from 1950 and is one of the last versions of the AR-88 receiver built in the USA and it's using a V-1 gear box. The two CR-91A gear boxes were obtained from VE8NSD and were "pulled parts" from Canadian government surplus purchased CR-91A receivers. The conclusion is that the V-2 gear box will only be found on some versions of the CR-91A receiver. photo left: "Version One" (V-1) of the gear box showing the full 360º split-gear that drives the main tuning dial. Note that the split-gear is mounted to the hub of the tuning condenser drive gear which appears to take up most of the lower part of the photo and is fairly reflective. The split-gear engages a gear that is mounted on the end of the shaft that drives the main tuning dial. Also, note that the anti-backlash spring is a loop type coupling the two split-gears. photo right: "Version Two" (V-2) of the gear box showing the 270º split gear that is not as robust and prone to failure. 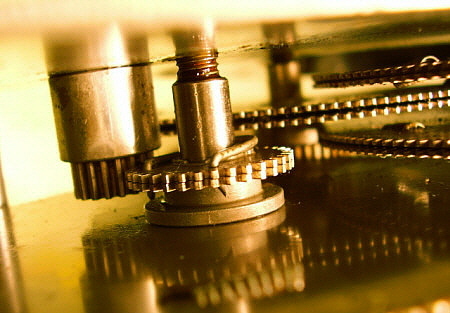 Note that these split gears are coupled using a coil spring type of anti-backlash arrangement. It can be seen that the split-gear is not as closely coupled and this may account for its tendency to break some of the gear teeth. Operating with Missing Shields - Many AR-88s are nowadays missing the bottom cover, the RF cover and some are even missing the tuning condenser cover. If the receiver was installed in a cabinet, such as the AR-88D or CR-91 were, then the bottom cover was not usually installed since the cabinet acted as the bottom shield. Additionally, the LO and Mixer/RF coil boxes are fully shielded, so the bottom cover is more for component protection than anything else. The receiver seems to operate fine with the RF cover off or missing, too. Its main purpose was to protect the alignment adjustments. The condenser cover should be in place for protection of the tuning condenser but a great many are missing and the receiver's performance doesn't seem to suffer with it off. Originally, the extensive use of shielding was to prevent LO radiation which then allowed the receiver to operate in the present of other receivers and transmitters without causing interference or being interfered with. Also, if excessive LO radiation made it to the antenna, it was possible for enemy Direction Finding equipment to pinpoint the receiver's location. Today, many AR-88s are operated in the ham shack with some of the shields missing with no serious issues. Since the AR-88 series probably should be operated with an electronic T-R switch, in the Voice mode, audio feedback is usually encountered in "transmit." Normally, when using the AR-88 in the ham shack, it is necessary to reduce the RF and AF gain controls during "transmit" to prevent feedback even if all of the shields are installed. "TRANS" Relay Control in NON-Diversity Receivers - This function operates in conjunction with terminals 3 and 4 on the rear of the chassis that are marked "TRANS RELAY." 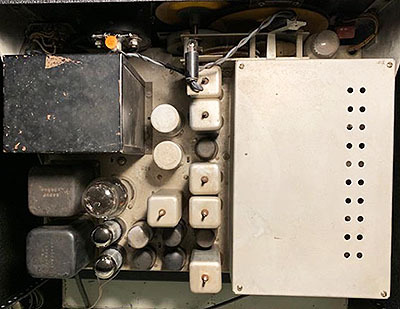 RCA, during the design of the AR-88, decided that the receiver should be controlling the transmitter and so the "TRANS" position of the function switch shorts terminals 3 and 4 when selected. Unfortunately, receiver control of transmission is the opposite of today's normal transmitter control of ham station's "Send-Receive" operations. Though it is possible to have an AR-88 actuate the remote Push-to-Talk line, allowing the AR-88 to control the "Send-Receive" operation, many transmitters don't have the PTT line brought out as a "remote" function. 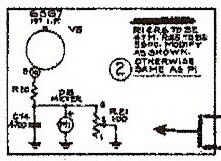 The easiest solution, if your mode of operation is CW, is to operate the station using an electronic TR switch such as the type made by E.F. Johnson. This allows the receiver to be left on while transmitting and the electronic TR switch will protect the receiver input. In the Voice mode, a TR switch will "feedback" unless 'phones are used. You'll still hear yourself in the 'phones though. A method of muting the AR-88 receivers is shown in the section "Using the AR-88 as a Ham Station Receiver - Easy and Reversible Muting Mod." See section "Operational and Modification Caveats" below for possible problems that can develop when the receiver is in the "TRANS" position. Additional Note: On some versions of the Diversity receivers, the two wires from the FUNCTION switch that provide a closure when selecting "TRANS" are included in the wiring harness and are both soldered to Terminal 2. In early Diversity receivers, the 2.5 ohm Z audio ground was not provided by Terminal 2 but was achieved via the Tone Keyer. RCA decided to attach the "TRANS" wires from the harness to this terminal since it was going to be grounded in normal rack wiring and operation.